David Friezo and his two brothers, Michael and Marc, first became active fundraisers for Memorial Sloan Kettering Cancer Center in the early 1990s. As participants in the New York City Marathon, David and Michael ran on Fred's Team, named in honor of Fred Lebow, co-founder of the New York City Marathon. Fred's Team has raised more than $50 million since 1995 for pioneering cancer research at MSK. Inspired by Fred's dedication to fighting cancer, the Friezo family became increasingly involved in supporting MSK's mission and donated $1 million to MSK to establish the Friezo Family Support Fund. The Friezo Family Support Fund helps to defray certain expenses for families with children receiving treatment. The Fund is critically important in helping families to cope with the substantial costs associated with pediatric cancer. As families are frequently required to spend considerable time in close proximity to MSK while their children are being treated, there is a substantial need for immediate and long-term housing. One, or possibly, both parents may stop working while their child is undergoing treatment, so some families face a further financial burden during an already difficult period. The Fund provides an opportunity to alleviate economic concerns while children receive outstanding cancer care at MSK. The Fund also helps to cover non-reimbursable costs, including housing modifications, parking, transportation, prosthetic devices, and prescription drugs. 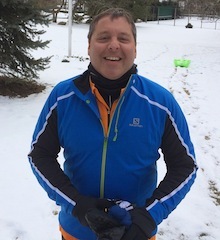 David will run on behalf of the Friezo Family Support Fund at MSK, determined to join the ranks of the 300 people around the world who have completed the North Pole Marathon. The Friezo Family Foundation, which improves the lives of children by providing financial support to charitable organizations that promote education, seek to eradicate disease and address poverty, and the Lydian Advisory Group, where David is the Managing Partner, have agreed to match the first $100,000 of donations made by individuals. Thanks for your support and please forward this page to all your friends, family members, and colleagues! Please click on the link to make a gift online. Please call 646-227-3687 with any questions.